When I added ‘support for ARM/Kinetis‘ to my bucket list in my Percepio+Trace post, I knew it will not be straight forward. But it was a lot harder than I thought. I had to burn many week-end hours. But finally I have Percepio Trace with FreeRTOS up and running for Kinetis and ARM Cortex-M4 with CodeWarrior for MCU10.2 :-). The ARM Cortex-M4 specific SysTick required some tweaks, plus a re-organization of the include files because of the Processor Expert Low Level Driver concept. Initially the timing was off by a factor of two because of the SysTick scaling factor or 2, and I believe I even found a bug in the trace library (which I have reported). At least with my fix the timing is now shown correctly. *  Interface header file to the Processor Expert Tick counter. *  counters (e.g. for Percepio Trace). *  of one of the standard FreeRTOS header files. * \return Tick counter value. The value is reset at tick interrupt time. 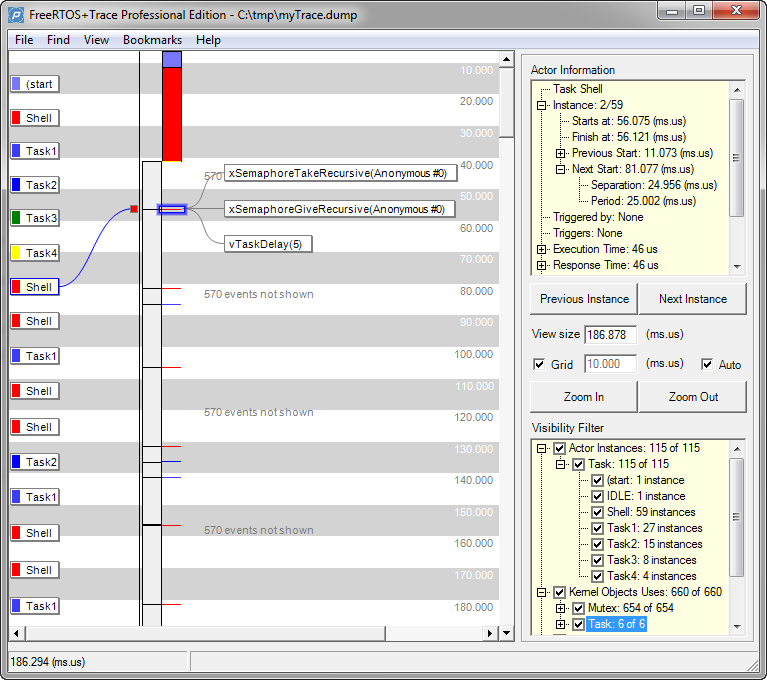 This file is part of the FreeRTOS component, and is used by the Percepio Trace library. This header file was needed to deal with the way how Processor Expert includes other component header files. The reason for the change is the way how Processor Expert has organized the header file includes for targets like Kinetis (using Logical Device Drivers): it pretty much includes all component header files in its common files. I don’t understand why they made that change? It caused a lot of headache because the FreeRTOS queue.c is using a private (non void pointer) type to access queues. With this now I can trace my applications on Kinetis, and given the 128K of RAM on the devices like K60 makes it possible to do long and extended trace runs. This entry was posted in CodeWarrior, Embedded Components, FreeRTOS, Kinetis, Processor Expert and tagged CodeWarrior, Debugging, Embedded Component, FreeRTOS by Erich Styger. Bookmark the permalink.